I hit an unexpectedly big low at the end of last year, the kind that sweeps in from your blind side and knocks you right out of your life for a few days. I was surprised, but on reflection realized I shouldn't have been - for most of 2013, my attention had been almost exclusively outward, problem-solving and balancing the lives of others but neglecting my own mental health. Not something I can afford to do. So with the support of my nearest and dearest, and a visit to the therapist who has helped me through many ups and downs, I made a plan to restore my inner balance. Part of that plan was signing up for art classes after a 10 year hiatus. 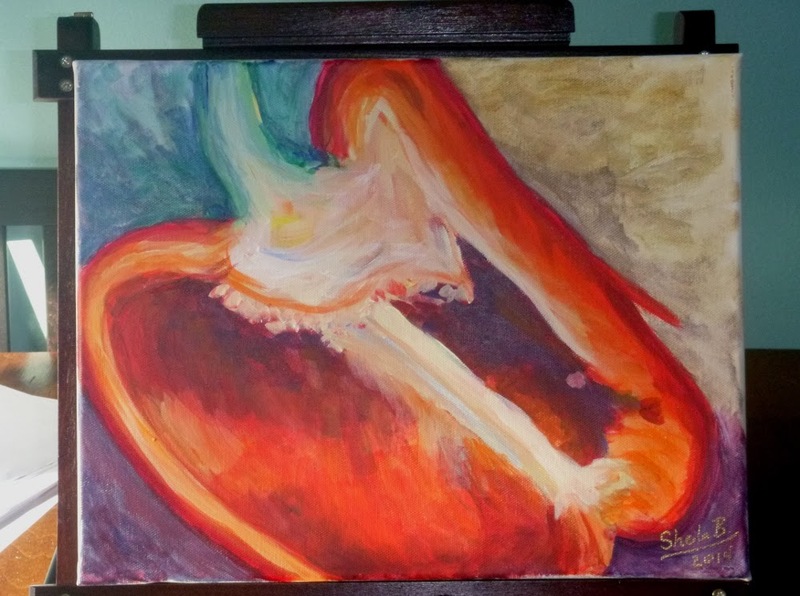 The lovely red pepper painting (an exercise in colour mixing) sits on my dining room table, reminding me to take time to do the things I love (and I love losing myself for several hours putting paint on canvas) not just the things that are required and needful. This type of re-balancing of life is something we must continuously be mindful of for our students and family members on the autism spectrum. It needs to become a stronger message in the world of autism intervention, which has the tendency to be dominated by the more panicked messages of "Hurry! More! Quick! Critical Learning Window Closing! Work Harder! Work Longer! Don't Fall Behind!!!" This animation of an exhausted high school student was created by my friend Owen, a clear visual of his inner state as he struggles to keep his balance in the "work storm" of summative projects and exam preparation that happens at the end of each high school semester. So you need to find out what it is that your ASD student/child/client truly enjoys, and make sure that you purposely make room in the schedule for that activity. If it's something you also love, make time to do it together - take a skate after school instead of sitting down at a table piled with homework, draw or paint, listen to music, read a story, watch a favourite show together. Alternatively, their favourite relaxation activity may be something you don't really understand, but you know that they love - like sitting alone & reciting the play-by-play of last night's hockey game or losing themselves in the tactile & sensory pleasure of running their hands through a bucket of beads (many of the things that are dismissed as "stimming" are actually pleasurable, relaxing and "balancing" things for the person on the autism spectrum) - respect their perspective and set aside the time. Make time to take time - you won't be sorry that you did.